In honor of our chickens finally starting to lay eggs, I tried making some lactofermented eggs this week. This is something I’ve been want to try for a while now. They turned out beautifully! And they taste as good as they look. Since I was unsure of the outcome, I only made 4 eggs which fit perfectly in a 1/2 quart jar (1/2 qt equals 2 cups or 1 pint, a little math lesson for you). Feel free to double this recipe for a full quart. I know I will! Stuff eggs in a 2 pint jar. Dissolve salt in the beet juice (add a little water if needed to dissolve salt). Add to jar. Add filtered water to cover eggs completely, leaving at least 1/2″ head space. Make sure eggs remain submerged and leave at room temperature for a day. Move to the fridge and let marinate for a few more days. Since I’m amazed at how many don’t know how to hard boil eggs, here is how to get the perfect egg. The older the egg, the easier they peel. A 3 week old egg usually peels beautifully. Fill a pot about 1/2 full of cool water, add as many eggs as you want (gently, you don’t want to crack them). Set on the burner at medium heat. Too high of heat and the eggs will crack. Bring to a gentle boil. As soon as the water begins to boil, remove from the heat, cover and set the timer for 10 minutes (6 mins for a soft boiled egg). Once the timer goes off, gently drain off the water and start running cold water over them. You can add ice to make them cool faster if you would like. If you let them sit too long, the yolk will start to turn green and get rubbery. 26 comments to Lactofermented Purple Eggs! Presumably the eggs are peeled in the recipe before putting them in the jar? This is probably a big DUH but maybe someone else has the question too…. Yes! Peeled 🙂 Better to ask and be sure than to not and be disappointed. I find it amusing that included is how to hardboil eggs, but no link on lactofermented beets. I totally agree the details need to be on the fermentation /whey part not boiling step….. I think the acidity of of the pickle would let the color go through the shells, it might take a bit longer but the shell shouldn’t matter. These look so pretty and I would like to try them! Just curious… Do you think it would work to just cut up a beet and put it in for color as I have some trady in the garden now? Sorry Elizabeth, I missed this comment somehow. I think it would definitely work to just cut up a beet and add it to the ferment. Great idea! The experiment is on. 24 hours at 1 pm tomorrow, and then into the fridge! Did you get a chance to post a beet ferment recipe I don’t see one but would love to try them. Could I add cooked beets or raw beets to the ferment instead of lacto-fermented beets? How long are they good for once refrigerated? I have beet kvaas already made. Could I drop the eggs in that? For how long? If so could I still drink the beet kvaas after I have eaten the eggs? I pickled some eggs in some left over pickle brine. The brine was purple as the pickles had included red cabbage, but over the 3 days I left it out (under cover of a tea towel) the colour of the brine completely disappeared. When I took an egg out to taste it, I topped the jar up with more purple brine, but again the colour disappeared really quick – has anyone experienced this, and any theories about what happens? The pigments from purple cabbage are different from the pigments in beets. Purple cabbage is colored primarily by anthocyanins. Anthocyanins are very sensitive to pH and tend to fade at low (acidic) pH. Betalins, the pigments found in beets are stable across a wider pH range. 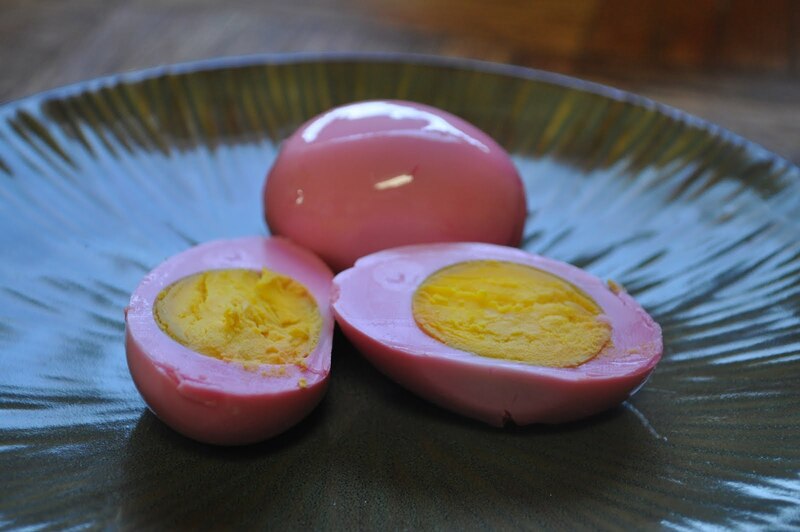 I imagine that your egg fermentation produced enough acid to fade the anthocyanins. By the way, I just made a purple sauerkraut with some shredded beets in there to intensify the color. I’m going to try to use some of that brine to color fermented eggs. I’ll let you know how it goes….